The big knock on Brendan Shanahan when he was drafted 13th overall in the OHL draft was that he couldn't skate. He silenced critics when playing with the London Knights with 154 points in 115 games in junior, enough to be drafted 2nd overall by the New Jersey Devils in 1987. And while his first year was a disappointment, the rest of his career was something legends were made of. After 21 seasons, however, Shanahan put his family first and has decided to hang them up. 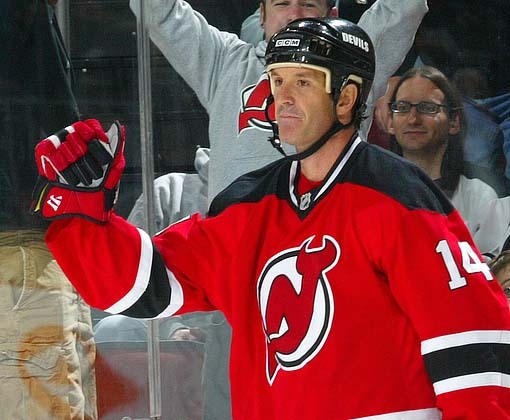 The only player to score over 600 (656) goals and have over 2,000 (2,498) PIMs in their career, Shanahan could be one of the most underrated goal scorers out there. While he only had one season of over 100 points, he had 12 seasons of 30 + goals, two 50 goal seasons, but somehow always got overshadowed by other stars on the team or was on a team that never got much credit due to the market they were in. He played over 1,500 games for five NHL teams (New Jersey, St. Louis, Hartford, NY Rangers), as well as the first Canadian Olympic team to win a gold medal in over 50 years. And while we can talk about the goals he scored, the intimidation he brought to his game, the three Stanley Cups he won; but I think the legacy he built for himself was being part of a lot of the changes to the game during the lockout that were implimented after the work-stoppage was over. The "Shanahan Summit," as it was deemed, took place in Decemeber of 2004 and was headed up by Shanny to think of ideas on how to make the game-play in the league better when it starts back up. The Summit was unique as it gathered up people from all walks of the hockey life, with GMs, players, and some media types there in order to get a wide array of responses in order to figure out how the ideas would be received. It must have gotten some decent response, as many of those ideas were brought into the NHL. Rules like creating a Competition Committee, streamlining goalie equipment, the "Delay of Game" call for puck going over the boards, shootouts to break ties, more access to media rights holders, and reducing obstruction. While other rules like wider lines and no-touch icing weren't introduced, they were amongst topic. Of course, some of these rules aren't as well received as others, but they were put out there to the forefront and for the most part, they have worked well to make the game better since the work-stoppage. Above all, his reason to retire makes him a class act. Shanny didn't want to uproot his family and when a team in the area (NY, NJ, Philadelphia) didn't want to sign him up, he decided that it was time to go. For a guy who was in a pretty stable area for most of his career, to put his family first when it was time to go. He had accomplished all he needed to. Three Cups, an Olympic Gold Medal, and ticket punched to the Hall of Fame in a couple of years' time. For Mr. Shanahan, his game, his personality, and his class will all be missed. 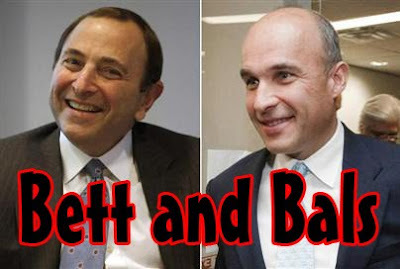 In any case, the first installment of "B&B" has to do with the recent news out about the NHL, who now owns the Phoenix Coyotes, and the City of Glendale trying to reach a lease agreement on the crazy 30 year lease going on. Gary Bettman: Now listen, listen-- I'm thinking about we end this year, then go on a week-to-week to basis from this point on. Okay, maybe week-to-week is a little much, sure-- but think of the demand of tickets if they don't know whether or not the team is staying or not. What do you mean "What about the arena employees??" Isn't the arena the Jobing.com Arena?? There ya go, just surf there and they're halfway to a new job. Hello?? Hello?? Jim Balsillie: HAHA-- oh Gary, you'll be the death of me. GB: How much did you hear?? JB: Enough to know that you're never going to sway the city like that. I mean, let's be honest-- as much as you say you want someone in the position to keep the team in Phoenix, odds are they won't be able to make headway with the city in order to get rid of that ridiculous lease they have lined up. GB: Look, we both know that the era of hockey in Phoenix in the NHL is coming to a head if we can't get something going. The team is winning and has a great array of talent and aside from the die-hards, no one is showing up unless it's a big name team they've seen on ESPN before. JB: By the way, how's that DirecTV thing coming?? GB: SILENCE!! Listen, once we find a sucker to take this team off our hands, we'll be fine. Even if I have to give it to that place that wanted to play some games in Toon-Town. I don't get it, Phoenix had the Coyotes and Roadrunners playing hockey at the same time and it's not called Toon-Town yet?? How the hell does that happen?? JB: What's the deal with the marketing?? Wasn't this area supposed to be all in support of this?? I had my fair share of people bashing me for my tactics. This is like the third time it's happened. GB: They caused an outlash because you're a douche. The fact of the matter is that I already have the die-hards' money. I need to get something going. Something needs to click. We've done the cheap tickets gimmick, we've done reduced sales, NOTHING!! It's like this climate can't deal with the idea of hockey. JB: Shocking. It's not like the sunbelt gimmick you tried to pull is a complete failure-- just look at the ownerships in the other places like Miami, Tampa, Atlanta....they're thriving in your experiment in all of this. It's not like they have ownership issues or attendance issues or anything like that. GB: But....but Tampa won a Cup. They had a guy who did the "SAW" movies and "Two and a Half Men," how could it go wrong?? The Thrashers have nine guys owning the team. GB: Nine guys. And Miami....well, who knows when David Caruso will pop-up and remove his glasses. If we have a "Guaranteed David Caruso Night" for a Panthers game-- oh boy will we have a hot bank for that market. If we can do that 41 games a year-- mo' money, mo' money, mo' money. JB:....and those markets are (scroll, scroll, scroll) 25th (Tampa), 26th (Florida), 28th (Atlanta), and 30th (Phoenix) in attendance figures. And it's not like there's not talent-- the ownerships don't know how to market a team in an area like that. They try once and when it doesn't happen for them, they don't try a different avenue. They think it's a one-shot deal and then flounder, wondering why it didn't work. You have to try different things, pick and choose....like your BlackBerry choices. GB: Oof....but how do you do that?? I mean, even with new owners-- who's to say it'll chance. Hell, we're not doing anything to make them more manageable. The insane part is the people who think movements will do anything. Let's be honest here, odds are this team won't be here in five years unless something miraculous happens. This team is Kansas City bound, hell....maybe we could give this ship to you. GB: No, but you got your hopes up didn't you?? GB: It's unlocked, we're trusting like that. Judge Redfield T. Baum: T-BOMBED!!!!! GB: God, I hate when he does that. JB: Are you kidding me, that's fantastic. It's the newest hook out there. GB: Always have to be difficult don't you?? JB: What would this horrific sitcom be without it?? It's time for another installment of the AGMs, with a guy who was dominant in the major junior circuit and had a decent career in the NHL. However, the true tale of the story lies in his comeback from a rare disorder early in his career. Folks, this is the AGM of Mark Fitzpatrick. While he didn't start playing organized hockey until the age of 10, Fitzpatrick began his junior-A career in Revelstoke of the BCJHL and while his numbers were less than what most people would desire (21 GP, 5.30 GAA, .860 SV%), he made the jump to the AJHL with the Calgary Canucks at the start of the 1984-85 season and then made three appearances as a 15-year-old with the Medicine Hat Tigers. With the Canucks, Fitzpatrick went 18-8-0 with a 3.75 GAA in his 23 appearances. With his short time in Medicine Hat, he went 1-2-0 with a 3.00 GAA and also played in on of the Tigers' playoff games. For the 1985-86 season, Fitzpatrick was ready for the WHL full time and didn't disappoint. He split time with Troy Gamble for playing time, but Fitzpatrick made the most of his chances. 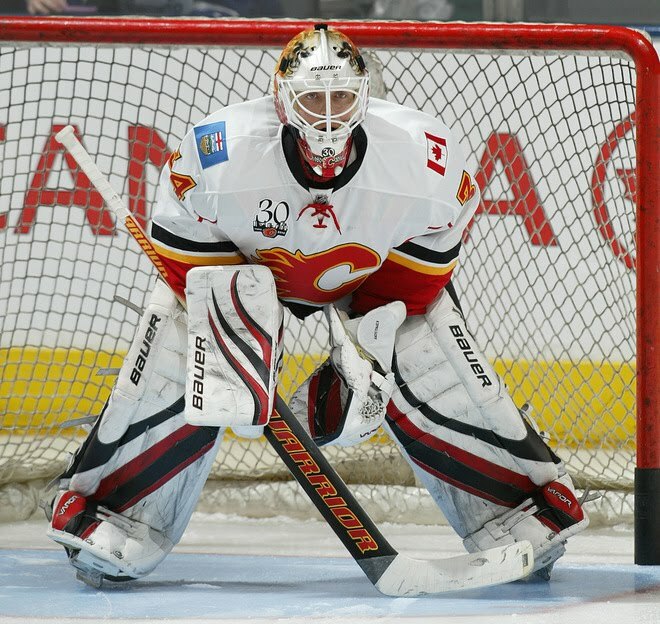 His rookie year, he went 26-6-1 with a 2.86 GAA, which set him up to win the Del Wilson Trophy for top goaltender and put him in the perfect position for his next two seasons. The 1986-87 season saw Fitzpatrick being thrown into the starter's role, with Gamble being dealt to Spokane early in the season. Fitzpatrick didn't disappoint, with a 31-11-4 record with four shutouts and a 3.35 GAA. While his regular season was good, it was Fitzpatrick's play in the Playoffs that got him the most acclaim. Fitzpatrick lead the Tigers to their second WHL Championship, their first in 12 years. The Tigers went to the Memorial Cup and kept rolling on the back of Fitzpatrick, who only had a 2.00 GAA in the tournament and led the Tigers to their first Memorial Cup in team history. The year itself boosted Fitzpatrick's value enough for the Los Angeles Kings to take Fitzpatrick in the second round of the 1987 Draft 27th overall. Fitzpatrick opted to stay in the WHL for another year to build on his stock. He helped out a lot, as Fitzpatrick got 63 games in going 36-15-6 with a 3.23 GAA and nine assists on the season. The Tigers continued to roll through the WHL that season, only needing 16 games in the playoffs to win their 12 to capture a second straight WHL Championship. The song remained the same in the Memorial Cup, with the Tigers dominating again, although Fitzpatrick's GAA was a higher level at 3.64, but it was enough to get the Tigers a second straight Memorial Cup, as well. It was a fantastic end to a out-of-nowhere goaltending prospect. The 1988-89 season saw Fitzpatrick make the jump to the professional ranks, splitting time at the start with the Los Angeles Kings and New Haven Knighthawks to start with. Fitzpatrick started the first game with the Kings opening night, winning 5-3 in his debut, but was sent to New Haven after that. In the AHL, went 10-5-1 with a 3.31 GAA, while in the NHL with the Kings, Fitzpatrick was 6-7-3 with a 4.01 GAA. Yet, while was considered to be the future of the Kings goaltending, it wasn't good enough when the Kings looked hard. For that, Fitzpatrick, Wayne McBean, and the every friendly Future Considerations was sent to the New York Islanders for Kelly Hrudey. Fitzpatrick took over the starting role with the Isles at that point, playing in 11 games to round out the season with a disappointing 3-5-2 record and a less than stellar 3.92 GAA for his troubles. The first full season in Long Island during the 1989-90 campaign was a little better, as he got starter's time, but kind of split with Glenn Healy between the pipes. Going 19-19-2 with a 3.39 GAA was helping hope be restored for Fitzpatrick. Sadly, it was short-lived. Before the start of the 1990-91 campaign, Fitzpatrick was poisoned by an ingredient that was contained in a part of his diet supplement. The amino acid, L-tryptophan, that was in the products he was taking caused him to develop Eosinophilic Myalgia Syndrome, a rare blood disorder caused by L-tryptophan. EMS impared the nerve and muscular systems of the body. Fitzpatrick experience fatigue, shortness of breath, as well as swollen feet, hands, and forearms. While it's incurable now, Fitzpatrick was able to overcome it and started off by playing in the AHL for the Capital District Islanders. He went 3-7-2 there during his stay and was called up to Long Island to play two games, going 1-1-0 during his time. 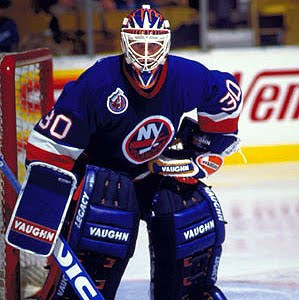 Fitzpatrick started off the 1991-92 season in the AHL to get his game back and was called by the Islanders in October. However, Fitzpatrick missed 10 games due to a flare-up of his EMS in late October. After he was cleared to play, he went back to the AHL in order to get a rhythm back before being called-up in January to get more time. In the AHL, Fitzpatick went 6-5-1 with a 2.99 GAA, while with the big club, Fitzy was able to get an 11-13-5 record and 3.20 GAA. Fitzpatrick captured the Bill Masterson Trophy for his return to the NHL that season. The 1992-93 season got off to a sub-par start with the Islanders and a 3-7-3 record before he was sidelined with a strained abdominal muscle, which got him back to the AHL to get a little rehab for five games (1-3-1). Yet, when he was bounced back to the big club, Fitzy went 14-8-2 to end out the season to make him a 17-15-5 guy for the year and a so-so 3.46 GAA. The summer of 1993 was crazy for Fitzpatrick, as along with a first round pick was traded from Long Island to Quebec for Ron Hextall and another first round pick. His tenure as a Nordique was short lived, as he was left unprotected and was picked up by the Florida Panthers in the expansion draft of 1993. For Fitzpatrick, it was his first time in a while as a back-up, since he was behind the workhorse of John Vanbiesbrouck. The 1993-94 season saw Fitzy make 29 appearance, posting a 12-8-6 record with a 2.73 and .914 SV% for his limited time. The 1994-95 season was more limited due to the lockout, but even so-- Fitzy got 15 games and put up a less than average 6-7-2 record. The 1995-96 season for the Panthers and Fitzy was a solid one, with Fitzy getting 34 games for the season and having a 15-11-3 record and 2.96 GAA, as the team marched all the way into the Stanley Cup finals with their rag-tag bunch of players. Fitzy got some time in those playoffs in relief of Vanbiesbrouck, but they were less than stellar in blowouts. The 1996-97 season was a dicey one, as even though he got 30 appearances, it was mostly in relief of Vanbiesbrouck. Fitzy put up an 8-9-9 record and 2.36 GAA for the year, his last full one with the Panthers. The 1997-98 season saw a logjam in net for the Panthers, with Vanbiesbrouck, Fitzpatrick, and Kevin Weekes up with the big club to start. While Fitzpatrick was solid to start off with, it wasn't good enough as he was put to the IHL with Fort Wayne before being traded, along with Jody Hull, to Tampa Bay for Dino Ciccarelli and Jeff Norton. Fitzpatrick was thrown into the starter's mix in the gongshow that was the Lightning, playing the bulk of the last 34 games and going a dismal 7-24-1 with a 3.16 GAA . It was his last in Tampa, as he was traded in the summer to Chicago for Michal Sykora. In Chicago, Fitzpatrick was backing-up Jocelyn Thibault and did respectable when called upon with a 6-8-6 record in 27 appearances, with a 2.74 GAA and though with a decent set of numbers, he could be a starter again. When he was signed by the Carolina Hurricanes in the summer of 1999, it could have been his chance to challenge Arturs Irbe. However, Fitzy didn't have a good camp and was beat out by Eric Fichaud for the back-up role. That put Fitzy in Cincinnati to play in the IHL for the Cyclones, where we went 11-11-1 in his time there before being called up by Carolina to appear in three games, going 0-2-0. 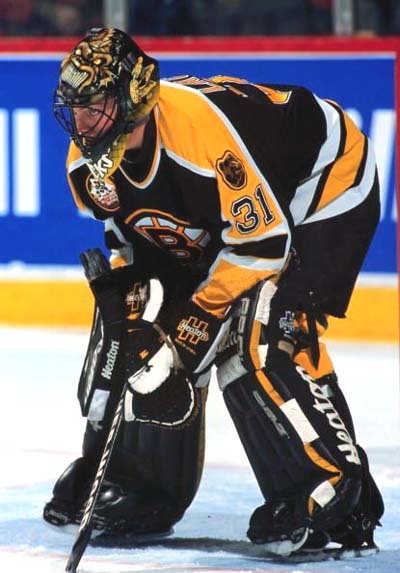 It would be his last season in the NHL, as Fitzpatrick played in the IHL for the Detroit Vipers in the 2000-01 season, but only appeared in nine games with a 4-4-0 record and 2.60 GAA and .919 SV%. 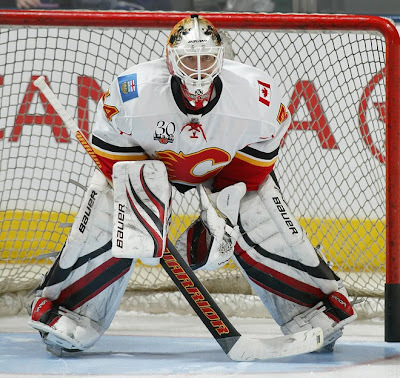 Fitzy got one last hack at the NHL when the Vancouver Canucks tried out many veteran goalies in a back-up role. Fitzpatrick had a good camp, but the Canucks claimed Martin Brochu in the waiver draft and played the role of back up to Dan Cloutier, thus ending Fitzpatrick's career as a player. Fitzpatrick's story is one of big success early with a lot of promise to the future, but thanks to a serious of unfortunate events, he couldn't get back into his winning ways. 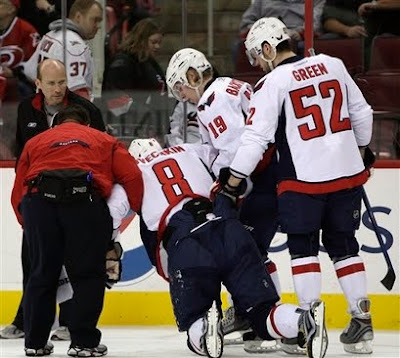 However, he didn't let the illness get him down and played to his best every time he stepped onto the ice. While the end could have been a lot better for Fitzpatrick, the experience was probably one that is unforgettable. As speculated months ago from my post about the Death of Creativity, the Colorado Avalanche unveiled their third jerseys and it was the same design as was speculated. Very meh and very underwhelming considering the leaks that came out and the lack of disagreement upon the leaks. It almost made this unveiling something we were waiting to get over with. 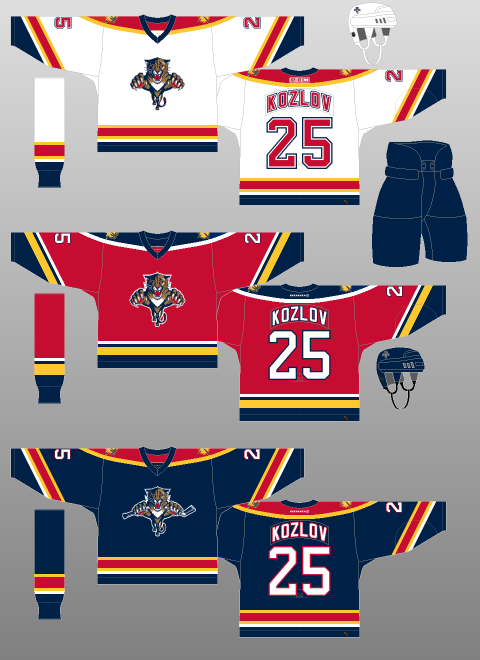 Another "meh" looking design is the next slated third jersey coming out, which is the Florida Panthers on the 23rd of this month. The Panthers are putting out strategic leaks, including the new crest on the jersey, as well as someone from the CCSLC posting a picture of part of the new third. And I have to say, I'm a bit underwhelmed by this, as well. I mean, the Panthers already have a navy jersey, and templated at that. You'd think with their old school red jerseys when they first busted onto the scene, they'd revert back to that color. It almost doesn't make sense to have two navy jerseys-- kind of like the Bruins having a black third jerseys with their black home jerseys. 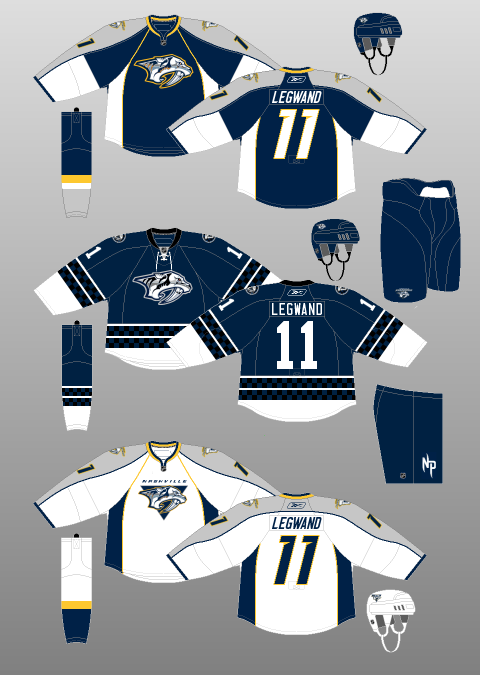 Same with the Predators this year and their navy third jerseys. 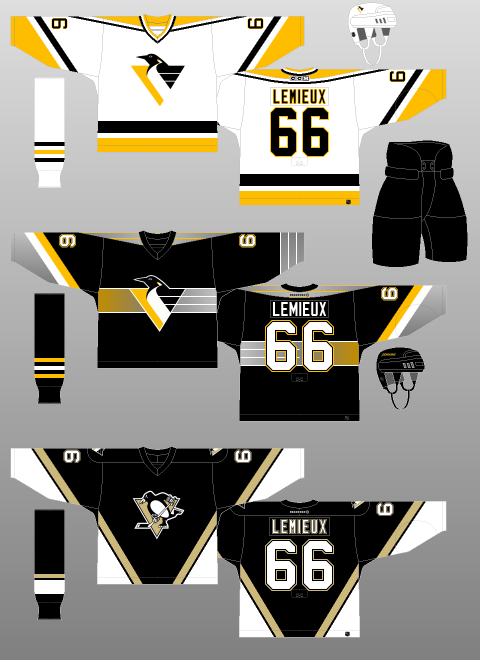 Usually a third jersey is something completely different from the regular sets. The entire third jerseys unveiled this year isn't that radical at all. They are kind of going through the motions and are just putting out something just to make some kind of cash. 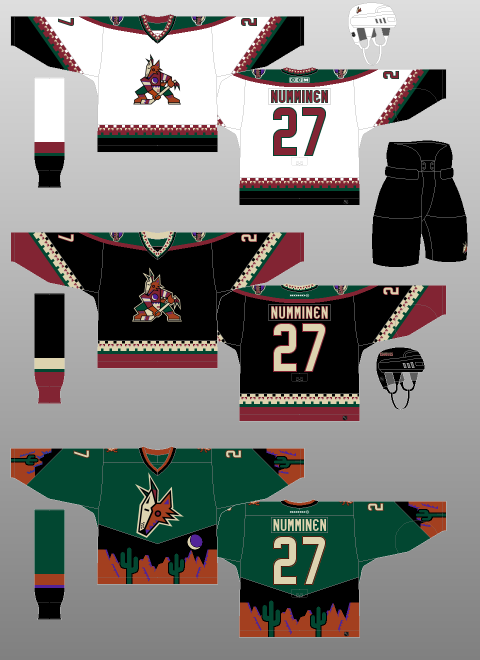 The Wild's thirds are very meh, with the green-- and the Predators jerseys are nothing ground breaking. Maybe it's the Edge system that's handcuffing the teams, but when you look at the Blues thirds and all the retro jerseys that are around; they are able to make something look decent and profitable. It goes back to the creativity issue and why some teams are lacking it. Maybe make some of these designs from CCSLC or other boards a look and a chance. You never know how much of a hit these designs could actually be, because most people seem to like it when it's posted out in public. Yet, in the end-- it's a cash grab-- let's be honest. Even if the minority of people aren't down with it, there's going to be a majority of people slapping some cash down in order to get into the trend of the new jersey buying. Sunrise, sunset. Now that we've all had a chance to breathe from Saturday night's Twitter debate (which is code for me being fashionably late), I'll throw my two-cents in and wonder what's going on over there with Allan Walsh and all that. If you hadn't heard, Allan Walsh posted on his Twitter page a questionable stat about Carey Price. This would be all well and good just in passing, but for Walsh-- he has a vested interest. His client is Jaroslav Halak, who is battling Price for time in the net in Montreal. So, while the stat in itself, that Price is 10W-25L in his last 35, it seems to be definitely uncalled for. Walsh said it was tongue-in-cheek, but the damage was done as it caught on with CBC's Hockey Night In Canada between games one and two, thus being taken to task by the crew there-- especially Kelly Hrudey. Of course, the ethical implications are in play in this-- because not only does it make him look bad, but it makes the target and pressure on his client to succeed in a market like Montreal that much bigger. While there would be heat in any market, you can't argue that this is making bigger news considering it has to do with Montreal and not, say, Florida. With Twitter being the immediate news source nowadays, it definitely a place where you should pick your spots and watch what you say. Yet, at the same time, this is not the first time someone related to Walsh has been in the cross-hairs of the Twitter-verse, as the kids say. Walsh's client, Martin Havlat, made his falling out with the Chicago Blackhawks somewhat public after the team didn't offer him a contract. That made the first wave of NHLers airing their grievances on the social networking mainstream. This begs the question-- is this all happenstances that the biggest issues when it comes to problems between players and their teams are with Walsh and his clientele or is this strategic planning by Walsh and his clique to go into business for themselves?? While I'm sure there's a bit of coincidence, you never really know because of the fact both people who have made the mainstream hockey media when it comes to the Twitter front have been linked to Walsh. I'm not saying, I'm just saying. Makes you think. If it is calculated, then it's bloody genius in some instance because of the fact we're talking about it and making a big deal about it. However, the doubled-edge sword thing is in effect because of the fact teams may be hesitant to deal with Walsh and his clients, knowing what he is capable of saying or doing. Plus, who'd want to be teammates with guys like that-- who's agent will slap down negative stats to a teammate and create awkward issues in the locker room?? This is either extremely brilliant to bring light to situations that are development and what other journalist would say in time or it's extremely stupid by making awkward situations and creating enemies amongst teammates and front office personnel alike. While the latter is more often than not the likely response, you have to say the buzz about each player was out there in a big way at the times of the happenings. Also-- shows the power of the social networking sites in this day-in-age. Many of the past AGMs have gone onto the coaching realm of the game, but never has one gone into that role early into their playing career. In any case, the fact he got that experience early foreshadowed his career after hockey, we present to you Jacques Cloutier as this week's AGM. Cloutier started his career in Major Junior as a 16-year-old with Trois-Rivieres in the QMJHL. While his 16-year-old season only saw him play 24 games, it led the way for his next two seasons, which got him to two Memorial Cups. For his second year in Major Junior in 1977-78, Cloutier played in 71 games, going an amazing 46-17-7 with a 3.48 GAA during that season. It help lead the Draveurs to the Memorial Cup, but they lost in the semi-final round. It was only the start for Cloutier's legend, when he played 72 games in 1978-79 with an even better 58-8-6 and a 3.14 GAA, which was enough to capture the Jacques Plante Memorial Trophy for best goaltender in the QMJHL. The Draveurs got into the Memorial Cup again, but again-- they lost the semi-final round. The combined record of 104-25-13 was enough to get Cloutier drafted by the Buffalo Sabres in the 1979 Draft in the third round. Though he was drafted, Cloutier spend one more year in Trois-Riviere, but it wasn't as memorable with Cloutier going 27-20-7 to close out his junior career. His first year in pro hockey was spent with the Rochester Americans, the Sabres AHL affiliate. Cloutier was thrown right into the starter's role for the 1980-81 season, playing 66 games and going an even .500 with a 27-27-6 record. The 1981-82 season saw Cloutier spend most his time in Rochester, but make appearances with the Sabres. For the Amerks, Cloutier went 14-7-2 in his 23 games, while in five games with the Sabres, Cloutier had a 5-1-0 record, which spelt good things for him in the future, so it would seem. However, in January 1982, Cloutier suffered a broken collarbone he had to work through throughout the season. The 1982-83 season saw another split in time with the Amerks and Sabres, but the Sabres was where he spent most his time backing up Bob Sauve. With the Sabres, in 25 games, Cloutier went 10-7-6 while with the Amerks, Cloutier was still stellar with a 7-3-1 record. Cloutier was able to play in the Calder Cup playoffs for the Amerks, in which he was able to get the Amerks to the Finals and help them win the Calder Cup in a sweep. Even with the great outings, the 1983-84 season saw Cloutier spend the entire season with the Amerks, not seeing one-spot with the Sabres. Cloutier was subpar for his standards, going only 26-22-1, but sporting a 3.83 GAA. Cloutier's play was able to settle down in the playoffs, helping the Amerks get to the Calder Cup Final again, losing to the Maine Mariners this time. It was quite a season in the 1984-85 season, as Clouter spent a majority of time in Rochester, but got a call-up and start in November of 1984, tying the Hartford Whalers in his only appearance. Cloutier only saw 14 games in Rochester (10-2-1), but torn some ligaments in his knee in December. However, as I alluded in the beginning, Cloutier was put into an assistant coach role for Rochester after his injury. Cloutier had one more year of split time between Rochester and Buffalo, as he was still recovering for his injury. The story was a bit off-kilter, with Cloutier playing very well in his 14 games with Rochester (10-2-2), but during his 15 games with Buffalo, Cloutier had a dismal 5-9-1 record, but a solid 3.37 GAA. In the 1986-87 season, Cloutier spent his season in Buffalo backing-up Tom Barrasso, though both were able to get close to split time. The season should be a forgotten one, with Cloutier going only 11-19-5 in his worst pro season to date. The 1987-88 season had Barrasso taking a majority of starts and had Cloutier fight off youngster Daren Puppa for some playing time. Cloutier saw only 20 games with a 4-8-2 record and 4.72 GAA. At the start of the 1988-89 season, Cloutier was returned to Rochester, where played 11 games, and going a horrific 2-7-0, but was called up in November after Barrasso was traded to Pittsburgh. Cloutier split time with Puppa and host of other goalies that season, finishing with 36 games played and a 15-14-0 record, getting his GAA down to 3.83. Before the start of the 1989-90 season, Cloutier was the odd-man out in the goaltending carousel for the Sabres, as he was dealt to the Chicago Blackhawks for the ever popular Future Considerations. When he got to Quebec, Cloutier was the back-up to Ron Tugnutt and saw only 15 games with a 3-8-2 record to show for it. It was a logjam in Quebec as well, with Tugnutt, Cloutier, Stephane Fiset, Scott Gordon, and John Tanner all available. The 1991-92 season saw all the goalies, san Gordon, come back and get time with the Nords. Cloutier was thankful to get 26 games in, but only was able to get a 6-14-3 record for his troubles. His shaky time in net made the Nords go out and get Ron Hextall to be starter for the 1992-93 season and Fiset was able to get the back-up job. Even with that, Cloutier was kept on the roster and not get sent down to the AHL. Cloutier only saw three games that year and went 0-2-1. Cloutier was again caught in a logjam with the Nords, as Hextall left-- but Fiset get the starting role and rookie Jocelyn Thibault getting the back-up position. Cloutier was again on the roster, but only saw 14 games in the season and had a 3-2-0 record to close out the year. It turned out to be Cloutier's last season in the NHL. 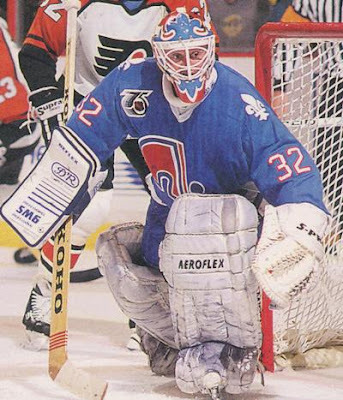 Immediately after his retirement, Cloutier was onto a coaching role in 1994-95 season as a goalie coach for the Quebec Nordiques and assistant coach of the Nords' AHL affiliate Cornwall Aces. He kept his assistant coaching role in Cornwall for part of the 1995-96 season, but was called upon by the Colorado Avalanche (after they moved from Quebec) to be the goalie coach, and then assistant coach after Jacques Martin moved on to the Ottawa Senators head coaching role. It lucked out for Cloutier, who was behind the bench when the Avs won the Cup in 1996. Cloutier would stay in the assistant coaching role with the Avs until June of 2009 when Joe Sacco came in and cleaned house. Cloutier was also able to get another ring when the Avs won the Cup again in 2001. 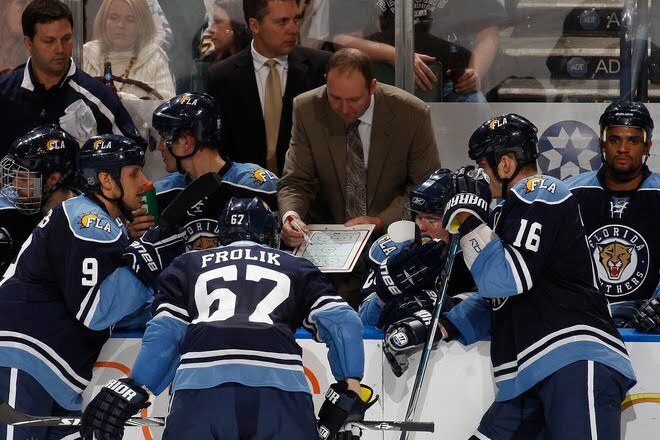 His leadership and a twist of fate was able to get Cloutier some coaching time, even when he was still playing. He's had plenty of experiences in his career in playing and coaching, mostly ending with a logjam forcing him out in one way or another. At least he was able to get some hardware to show off his success before he was forced out. It's another story, though, of a goalie being great in juniors and the minors; but circumstances stop them from being great in the NHL. The man with an amazing Andre the Giant impression, Greg Wyshynski, and his crew over at Yahoo's Puck Daddy unveiled the first of their "Best and Worst of the Decade" session with the best and worst jerseys. It was a tough task, as I don't think there has been more changes in jersey style, design, and fabrics as it has been in the past 10 years. Yet, I have to disagree with the Montreal Canadiens' barber-pole jerseys as the worst in the last decade. 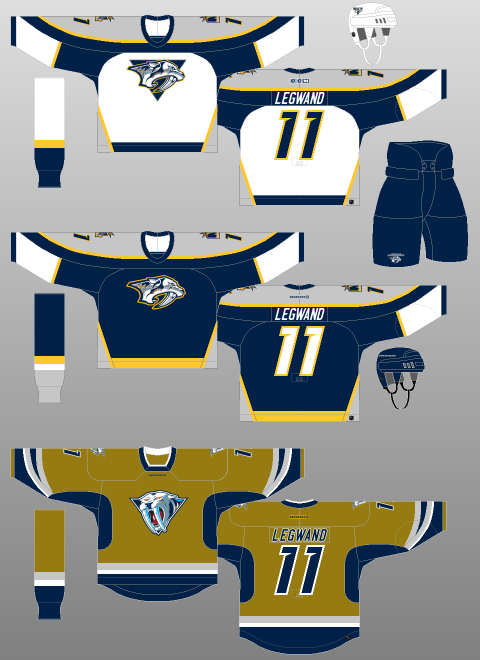 I'm not going to say it's the best, but hardly the worst; especially considering the Predators' mustards were not included, nor were the Coyotes' green jerseys-- though I liked the greens for a small time. Lest we forget the Canucks' gradient thirds or Penguins robo-penguin, either. But, like I said-- plenty of jerseys in the past 10 years, and I don't even Wysh for not tapping on all of the jerseys that have been thrown out to the public for the decade. However, if you want to talk about the whole retro movement when it comes to the culture of sports-- fact of the matter is that nothing says more retro than the barber-pole jersey when it comes to hockey. For the most part, the barber-pole was the template at the time. Most of the original teams used a form of the barber-pole design, with the original Ottawa Senators using them in the inaugural season of the NHL in 1917-18, with the Hamilton Tigers adding to it in 1920-21. In 1925-26, the Boston Bruins and Montreal Wanderers developed a form of the barber-pole, with moderations here and there-- whether it be just on the sleeps or thicker lines and broken up patterns. By the 1927-28 season, the Senators, Bruins, Montreal Maroons, Chicago Blackhawks, Detroit Cougars, and Toronto Maple Leafs had a variation of the barber-pole in their motif. 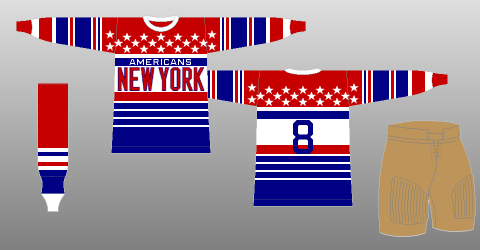 Not as wild as the New York Americans, who were basically wearing the United States flag as a jersey. Through the 20s and 30s, the jersey style stayed in tact, with many teams trying it out and many keeping it for quite a while. However, but the 1938-39 season, the Chicago Blackhawks were pretty much the last to have a barber-pole jersey in the traditional sense of the style. The Hawks then retired their barber-pole at the end of the 1954-55 season. The style had laided dormant for many years, until the NHL's 75th anniversary, when the Hawks, Bruins, Red Wings and All-Star jerseys all had a retro barber-pole design to them, even if the ASG ones only had them in the arms. Even in the junior ranks, the Ottawa 67's used the barber-pole for numerous amount of years in the OHL, as did the Chicoutimi Sagueneens in the QMJHL. While most of the retros are brought back because of how hideously classic they are (Canucks' flying V, Pens' baby blues, Flyers' mismatched nameplates, Cooperalls), I believe the barber-poles are more tradition than tacky. They bring the game back to a simpler time when you didn't need the flash and dash to sell jerseys, you just needed the team colors and maybe a logo. Most the time, the logos were only letters and it couldn't be simpler than that. I know that many have called for the Ottawa Senators to change their third jersey look to incorporate the shoulder patch logo in a mini-barber-pole design. We all know Pascal Leclaire is into the barber-pole, as his pads definitely say. 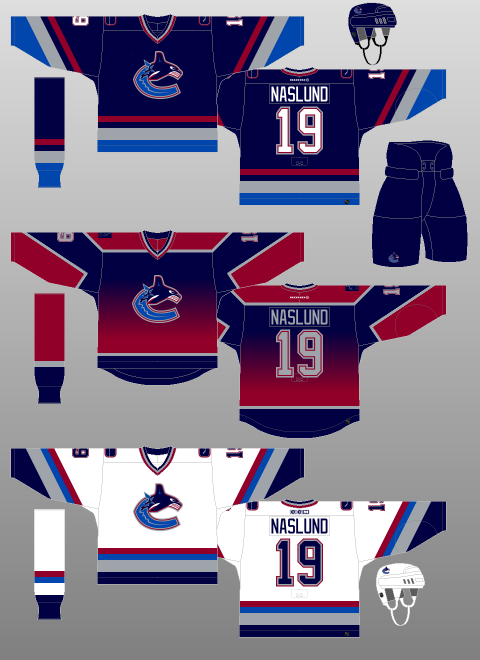 If you haven't already-- check out NHLUniforms.com, where I got all the hotlinks and historical rundown from it all. Great site for jersey and logo freaks. Putting the Jackets On To Leave?? Interesting story coming out of the Columbus Dispatch, where a story is saying that if a new financial model cannot be found to help out the Blue Jackets, there's a distinct possibility that they could leave Columbus. According to this report, the current ownership and the City Chamber is looking to find a model that will help the Jackets' with the $5M in rent they pay a year, as well as the $4M a year they lose in operational costs. The ownership apparently wants to have this settled, or at lease something done by the end of the calendar year. I could be wrong, but this is the first time the Blue Jackets' name have come up in terms of moving from their area. The area they are in is a very snazzy one, with a lot of establishments nearby. The arena itself is beautiful, as is the practice facility next store; but in these tough times, no one seems to be immune to having to deal with financial hardships of that sort. Though, you have to wonder, considering the city voted not to give public money to building the arena, if they'll do anything of sort to really help out the team and keep them in the city for the long-term. Although, now that the arena is making money with concerts and stuff of that ilk; so who knows. To an extent, I almost look at the Blue Jackets as the Atlanta Thrashers of the North; a team that has the talent to be great, but can never get to that next plateau due to not having depth in their system. Now, another comparison is going to be whether or not the team will be in the same city in the next five to ten years from now. Granted, there's a lot of economic issues and numbers being thrown around and I'm sure that there's much smarter people within the area who could tell you more and tell you if it's just propaganda to get more money out of the city; but it's now out there from the doing of the city and not just rumors and guessing. Yet, even with this out there now-- could this spell the return of everyone's buddy Jim Balsillie in terms of trying to buy the franchise and creating a hoopla around it again. Of course, the NHL is kind of pre-occupied with the Coyotes and all, so who knows how they will address this. 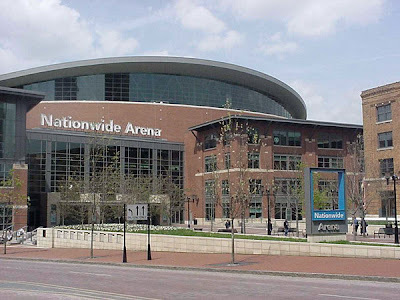 The question is whether or not if this whole thing goes down, if the NHL will seek someone to keep the team in Columbus, even if a system in Columbus won't work. How much will the NHL push to keep a team in a city when the city even says they won't help out on?? The different issue with Phoenix is that the City of Glendale is actually trying to help keep the team in the area, which is probably why the NHL is pushing so hard to pull out all the stops to keep the Coyotes in the area. While this is still developing, we can only wonder what kinds of twist and turns this whole saga will take now. If the NHL didn't have enough headaches with other kinds of speculations with other teams, now they have to deal with this. While Columbus has the ability to be a big time team, the attendance continues not to be there; which doesn't help the cause for the future. The Jackets are regularly at the bottom third of the league for attendance, hovering around 85% capacity for their troubles. It's a wonder if something can't be reached in terms of relief, whether that number will increase in support or decrease in depression. Only time will tell. There have been many times in the recent past where I have wondered about writing a book. Of course, we have the book about my own issues "There Are So Many People Up Here", but I have often thought about doing a research book about the history of hockey in my home city, Baltimore. Of course, that would require me to do work, and as I've stated here before-- I'm lazy. Yet, even with that-- the heritage of hockey in Baltimore is pretty interesting. I mean, teams in Baltimore started in 1932 and there was always a professional team based out of Baltimore until 1997, with the exception of 1978. That's a nice long run for a city who really looked at football and baseball as a top priority. Baltimore was the place of the first competitive hockey game between Johns Hopkins University and Yale University, which ended in a 2-2 tie. Baltimore was also home to the first artificial ice rink in 1894, though there is no truth to the rumor that the surface is the same surface that used in the First Mariner Arena today. While this is quite a task, I'd love to be involved in doing something like this, but sadly-- the internet can only do so much. With many of the history of the city and the game being unregistered, I wonder where I would actually begin my search, who could I go to, where would I go to get such information if the Internets is tangling me up?? In addition, it makes me wonder if hockey could work in Baltimore again. There's plenty of people who are hockey starved in the Baltimore area and may not feel like traveling to Washington, DC and paying the major league prices. Granted, the last few ventures failed in the Baltimore area, mostly caused to the Baltimore Blast running the arena and giving the Bandits craptastic dates. It's the nature of the beast, I suppose. 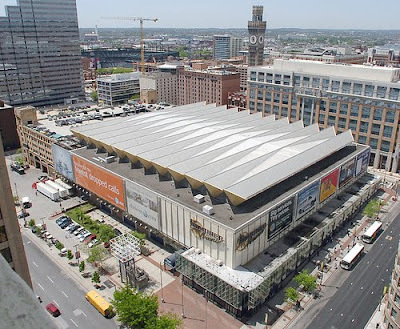 Fact of the matter is that Baltimore will need a new arena for a team to come around and they'll need to have someone who's willing to keep a team there for the long haul. But we're getting ahead of ourselves here. The task at hand is where to find history about Baltimore hockey and if anyone would be interested in hearing a vast history of this city and it's teams. I think some people feel that way about their cities who may be under appreciated hockey towns who may have only housed minor league, but still have a rich, rich heritage. These stories need to be told because you have to get this out to the masses and show that there are plenty of places that may not be the "norm" for a hockey team, but the people come out and support the team regardless of the team or league out there. As for now-- time to figure out how to get this ball rolling and how to get the historical records needed to make this dream.....still a dream, but maybe a step closer to reality. Doubtful, at least the idea out there for someone to feed off of. With all the hoopla going around with Jacques Plante's 50th anniversary for putting on a mask for the first time in Modern History (November 1st, 1959), we have to go to the guy who was the LAST to not wear a mask for the sake of not wearing it. This week, we turn to the man who never needed to save face, Andy Brown. While his start was something of a low-key entrance, playing in the OHA with the Guelph Royals and Brampton 7-Ups in the 1962-63 season, playing 40 games in total with a 5.29 GAA combined in that season. Brown took an unexpected year off before returning to the ice in Newfoundland, playing with the Gander Flyers in the senior league. It was a shaky year for Brown, as he went 5-13-0 with a 5.84 GAA. However, getting back into the groove sparked his confidence for the next step. In the 1964-65 season, Brown went to play with the Johnstown Jets in the Eastern Hockey League, playing 70 games that season with a 39-29-2 record and a solid 3.61 GAA. It was good enough for him to get sort of an audition with the AHL's Baltimore Clippers, where he played 14 minutes and allowed three goals. It wasn't much, but it was something for Brown to get his foot into the door. Brown remained in the EHL for the 1965-66 season with the Long Island Ducks going 23-19-3 with a 3.07 GAA before going back to the Johnstown for one game in a losing cause. Staying in Johnstown for the 1966-67 season, Brown saw 72 games for his troubles with a 38-25-9 record and a solid 3.79 GAA. The play in the EHL was good enough for Brown to get a shot with the Clippers in the AHL for the 1967-68 season. Brown played in 41 games that year and held his own in the higher league with a 16-19-3 recored on the year. Two more seasons were spent in the AHL for the Clippers, with the 1970-71 season being his best, playing 52 games and going 28-13-8 and a fantastic 2.86 GAA for the year. It was good enough for Brown to take yet another step. In the 1971-72 season, Brown was claimed by the Detroit Red Wings in the inter-league draft, thus making him a part of the Red Wings clan. Brown played for the Fort Worth Wings in the CHL (9-4-3; 3.25 GAA) and the Tidewater Red Wings in the AHL (4-16-1; 4.04 GAA) before being called up to the Red Wings roster to start 10 games for the Wings. Those 10 games saw Brown go 4-5-1 with a 3.96 GAA and on his way to some obscure moment in time. However, Brown was playing during the heated NHL/WHA rivalry for players, in which Brown was picked by the Minnesota Fighting Saints in the WHA Draft in February of 1972, which is why he could have been called up to make sure he didn't jump ship. Brown started the season with the Fort Worth Wings in the 1972-73 season, before being called up for seven games to play with Detroit; a 2-1-2 record followed. However, in February of 1973, Brown was traded to Pittsburgh for a draft choice and cash. Brown played nine games at the end of the '72-'73 season behind Jim Rutherford going 3-4-2 in that time. The next season, Brown got more time, leading the games played by then end of the season with 36 games posting up a 13-16-4 record and breaking the single-season record for most PIMs by a goalie with 60, which has since been broken. 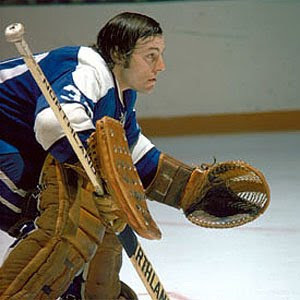 On April 7th 1974 against the Atlanta Flames, Brown lossed the game 6-3, but would become the last goalie in the NHL to play without a goalie mask on. It was his last NHL game, but not his last game in the pros. During the summer of 1974, Brown's WHA rights were traded from Minnesota to the Indianapolis Racers, where Brown would land for the next three seasons. The 1974-75 season would be rough for Brown and the Racers, as he set the single-season record for losses with 35, finishing the year at 15-35-0 and 4.15 GAA in 52 games. The 1975-76 season saw less time for Brown, as he only got 24 games behind Michel Dion. Brown was able to get a little better with a 9-11-2 record, getting his GAA down to 3.60. With a logjam in net for the 1976-77 season, allowed Brown to get only 10 games due to spinal surgery, with a 1-4-1 record and 3.63 GAA. It would be the last for Brown, who still refused to put on the mask. Brown had hobbies he did during the year of playing, which helped him transition from hockey to everyday life easier, like racing cars. Brown had once wanted to race the Indy 500, but he never got to that point. He did work on cars and kept them in top-notch shape, plus he raced near his hometown in Hamilton, Ontario-- often taking the checkered flag at those local events. After his retirement, Brown stayed in Indiana to raise horses. Though he took his fair share of shots, Brown always said that he couldn't see right when he wore a mask. He did wear one in practices, but due to him not being able to see, he never wore it during the games. Yet, Brown took his bumps and bruises with pride and always seemed to deal with it gracefully. He will always be a part of history, as he was the last man standing without the mask. Here's to you, Mr. Brown.